Navigate the underwater world of Naboo with the Gungan Sub! Jar Jar Binks guides his friends Obi-Wan Kenobi and Qui-Gon Jinn through the watery core of planet Naboo in the elegant Gungan Sub. Built to resemble some of the many creatures that inhabit the underwater world, the Gungan Sub features a large cockpit, cargo bays, storage boxes, rotating tail propulsion, missiles and even a mini-sub with harpoon. Includes Queen Amidala, Obi-Wan Kenobi, Qui-Gon Jinn and Jar Jar Binks. • Rotate Qui-Gon Jinn and Obi-Wan Kenobi minifigure heads to reveal decoration with underwater breathing devices! That's a really nice set - really cool to see this here! I love the minifigs and the sub actually looks a bit like a manta. They actually bend pretty similarly to that in real life. You assemble them straight and make a 180° twist of the tail assembly after. Every time I see this set, I wonder what that thing with all the orange cones is. Here's my MODO version. I created HDR-map for this version by placing the reflections and activated the Luminous shader for the green and orange parts. I keep looking at real LEGO pieces and I still think it looks too waxy. For example, we can see the light going through jar-jar head which does not happen with the real parts. True, but overall the MODO materials look pretty good. The way that the light catches the rounded edges look nicer than the Blender version, in my opinion. I totally agree for the round edges of Modo. The shader that I use is not developed by the Blender team and it is just a script made by a talented user. Therefore it is not really comparable in terms of result and optimization. You might have noticed that it doesn't work for edges behind transparent pieces too. Besides, 3D rendering is not my job and I'm sure a Blender pro would be able to update the materials to a whole new level! It's the SSS. Mybe 40% is still to high but the "waxy" effect depends also on the intensity of the HDR or a light. 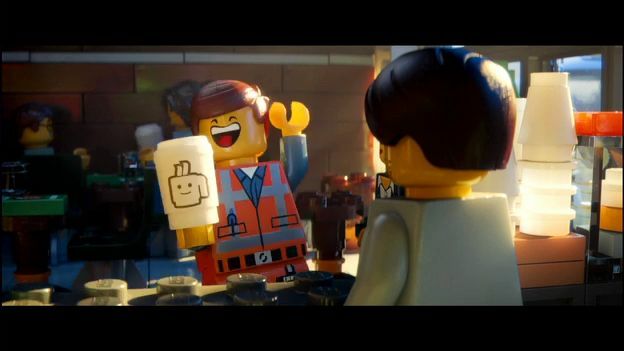 In the LEGO movie you will also recognize extreme SSS effects depending on the lighting situations. I have to test how low I should setup the SSS before it starts to look cheap. The SSS is in general very important for the look. If you would light Jar Jar's head with a brighter light from behind or the left top side in my scene I am pretty sure you would see this effect at his head. I set SS of all solid bricks from 40% to 20%. Jar-Jar was 60% what caused the extreme SSS effect. I definitely prefer the second version you posted. It is getting closer to real bricks. It is good that you kept both version here. It is easy to compare. Yes. Lower SSS seems to be better but it can make the look more boring. I don't think the goal is to simulate a real shot LEGO model. There's room for a more promotional style. The same method you all know from commercials where most products will be presented polished and mostly off the original to sell them. I will do some intense tests within the next weeks (hopefully) with real LEGO bricks of different colors with real lighting situations. I will shoot a good HDR of all these situations to find a good comparison and balance between a real plastic look and a nice promotional look. I guess to make a good image (not boring) not only the shaders are important but also the scene setup (background, lighting, framing, etc.) as well as post-processing. I'm sure that even with average materials but a nice environment you could provide more emotions to the viewers. Exactly. Zanna, who uses Blender template materials creates amazing scenes with lots of action/emotion in them, just by adding effective lighting and an appropriate environment. That's completely true. The idea comes first. The execution is another thing. I am still in a phase where I see all this more from a technical pov. Once you have worked out a great setup Zanna's scenes would be boosted to 100% more awesomeness. And they would help to finetune things again. In my opinion, as virtualrepublic (Renderbricks) said, message (idea) is the most important thing. Every image is a way to comunicate something, technique is "only" the background. I'm the first one to admit that my technique and my 3D skills are very limited (I can only put lights, set cameras and play with a few settings) and when I watch virtualrepublic's renders I think "OMG, I would have those material settings, those fantastic edges, etc... etc...) ... but I'm not working for Lego®, so I'm happy with that. I just added my render. It uses volume absorption and scatter in the environment to create the underwater effect. 5 hr render time with a 4 CPU cores, at 2.5 K samples. This was a fun scene to set up! Did you put a mask in front of the light source to make the rays? Yes, for those effects you have to set the samples very high. There should be a separate sample rate for the volume effects I think?! ^ Thans! Yes! It would be so nice if effects like this could have their own way of sampling… I agree, the lights definitely give it a different effect than a "luminous shader" (called emission shader in Blender). At least in Blender, the glowing effect doesn't really have the right feel. Yes. I was too lazy to place lights. You should take a look at the spot lights if you can adjust the source to the size of the bricks. Yes you can. The lamps under the pieces (called point lamps in Blender: spot lamps are something else! ) can be sized. I could probably make them a little bigger before they start intersecting with the piece or the stud of the part below. Alternatively, I could create a scaled down version of the piece with a strong emission (luminous) shader to fit the shape more but still give the same effect. Thanks for the idea! Playing with lights and volumes. Adding them to my promotional look and style. Now rendering two more versions. Last picture is a direct screenshot from MODO. Rendering now in final quality. Final comp tomorrow. The last one looks great! We're going to set some kind of record for most comments on a single set. I didn't know it would attract some many comments when I finished the model last week! My keylight was set too dark. Corrected. Rendering overnight a new version. Latest picture optimized and OUT! Nice! The atmosphere is pretty good, it captures the scene well. The lights look so nice without all the noise! Is the beam effect in the render environment, or added afterwords? I guess the last render is now perfect. It's underwater. So I need to add some fog to it. I am also uploading a movie showing the compositing. Here is my combine in AFX. I googeled a background from the original scene for the comp. - Optical Flares for a descreet athmo light effect. Okay, I figured out how to decrease noise! Here is my new render, with branched path tracing, which is a different way of calculating light paths in Blender. Normally, Blender picks one light randomly in a sample, and creates noise. With branched path tracing, it calculates light from all sources, and also allows you to set different rates on sampling for different kinds of light paths and materials. It seems like a really powerful tool, and I'll hope to be posting about it in the forum soon. Also, this render took about the same time because none of branched path tracing options (that I know of) give extra samples to the volume scatter. Render time was about 5.5 hrs, but only 1800 total samples were used. The sub itself (without volume scatter and absorb) probably would have used a lot less, but I haven't found a way to render volume scatter extra.